If you are a parent then you no doubt understand how difficult it can be to keep on top of the accumulation of toys. And random stuff. It builds up. And just like all other areas of the home, children’s areas need clearing out and organising occasionally. I feel a little guilty when I take their things away. But I also think it’s important to create calm spaces for children. Just like adults, if our physical environment is unorganised and we are surrounded by a large amount of choice, it can often leave us struggling to focus or make a decision. I quite like the Montessori method and just completed a great course by Simone Davies on Setting up your home Montessori Style. Some of the elements we have already implemented into our home, and I learned many more great ideas. 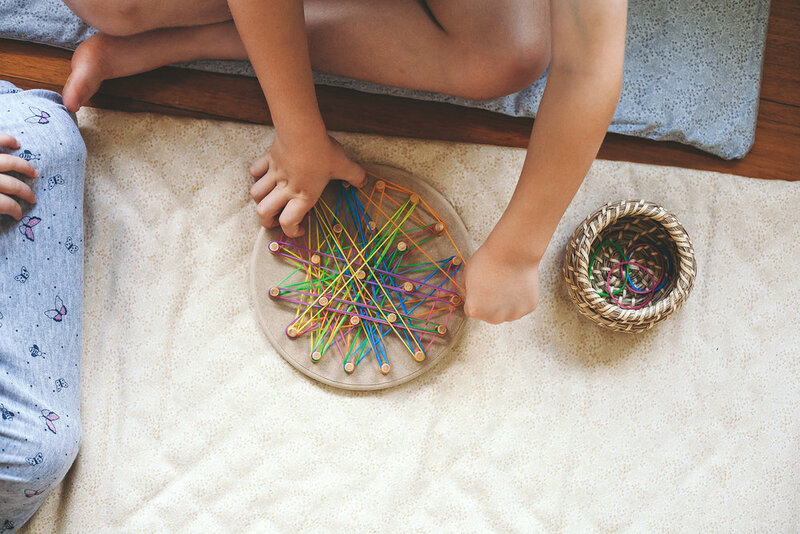 In particular, I like how the Montessori method encourages independence and mastery, teaches children to respect their belongings, and to appreciate beauty. 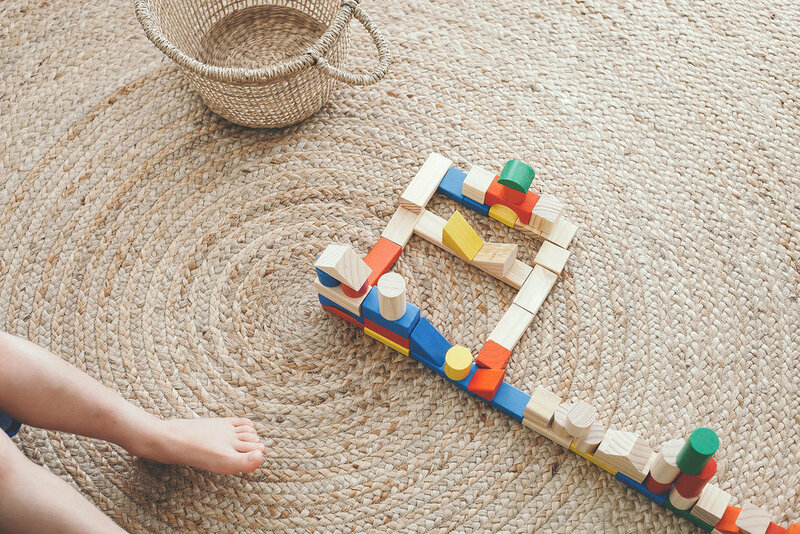 With my personal experience of having two young children I’ll share with you the elements that work for us, and may inspire you also in creating child-friendly spaces in your home. Less is often more and it helps to keep children’s spaces simple. Light colours on the walls create a sense of space. Windows open allow natural light to flow in. 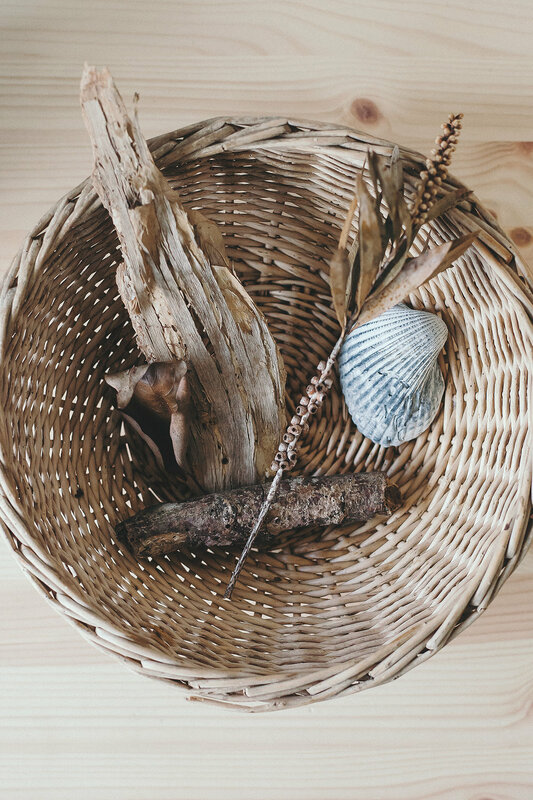 Keep the amount of toys to a small number and present them so they look appealing - in natural woven baskets or wooden trays. Lean towards simpler toys or activities rather than battery operated noise makers. It’s also nice to bring nature indoors to help children appreciate natural beauty. Adding plants to their playroom or bedroom. And a nature basket where they can display collected pieces from their walks outdoors. My daughter Leila (2) is currently not liking this one - she says yucky and won’t go near the basket. But my son Soren (5) has added a couple pieces and seems to respect the idea. I had to laugh though when he recently carried in a large brick to add to the basket. Hmm. Children love independence. And it’s often the cause of much parental frustration when children have to do things on their own and we say no due to concern. Which can result in a little meltdown. But it’s important to encourage it and welcome it, as frustrating as it can be. And it can actually help us out once they master everyday skills like getting their breakfast or clearing the table. It also builds confidence. We can encourage independence by making daily tasks easily accessible to them. Like having plates in a drawer at their level, a step to climb up and reach the bathroom sink, clothes within their reach and so on. And refrain from always correcting how they do it. There will be spills and it won’t be the way we do it ourselves, but that’s OK. It’s how they learn. Just keep demonstrating how it’s done ourselves. I’ve made a few recent changes like having a dustpan at their height, changing their plastic cups to glasses, and adding a mirror in their bedrooms along with their own hairbrush. One way I encourage this is by teaching our kids to clean up their space themselves. When our kids play with a toy and walk away to start on something new, I gently remind them that if we are finished with this one then we put it away before bringing out a new one. And I show them where it belongs. There are exceptions to respecting toys - like how 5 year olds like to crash and smash their trucks. But we know this is to be expected with certain toys. If however they begin to throw coins across the home then I step in and explain they could hit and smash a picture or each other, so they understand. I think it’s so important as a parent to notice and encourage what a child is interested in. To help them master an activity they gravitate towards. And to do this it first comes down to presenting a various selection of activities to them - music, art, construction, motor skills and so on. Observe what they enjoy, and make it easily accessible for them to explore further. Our son for example currently loves construction. I recently went through his room and stored many items that weren’t of interest and cluttered his room. And reduced it to those that he seems to be gravitating towards - like Lego, Superheros and Bruder trucks and cars. My daughter seems to enjoy music. So we have instruments always available in their playroom. They may get bored after a while, and that’s normal too. But it’s about giving them an opportunity to play and explore their interests that matters. Children like to feel safe in those earlier years. And creating cosy spaces and a sense of intimacy can help them feel safe at home. I also think it’s nice once they start at school to have a calm and cosy space to come home to that helps them wind down after a pretty busy and loud day. Ways that we can create this is by having a big comfy floor cushion with a basket of books beside it, or window seat with soft cushions. A lamp on their desk in their bedroom or string lights hung from their window. An oversized chair for sitting together to read a book or a throw blanket for snuggling together. This one I learned from Simone’s course and love. We don’t need to get rid of all their toys and belongings. But instead invest in a few storage tubs to store items and put out of sight to reduce the clutter. And then rotate items on a weekly basis, or when they are no longer interested in an item. It means that new toys they tend to forget about become new and exciting again. And it helps to keep the home spacious and calm. It is possible to create a home that accommodates all the family, without colourful plastic toys taking over the house. And no matter what size, creating a space for children can happen. We recently moved into a house which has a playroom. But in our last home which was a small townhouse we didn’t have such a thing. Instead I created a little cozy area beneath our stairs for the kids to play in. And it was just as special. Quite often as a parent we put our needs last. And have a to-do list that never seems to end. So we push and push ourselves, often declining any help, and then we get tired. We ignore being tired. And then it can lead to burnout, and at times a little meltdown. When we burnout it’s much harder to help others. We could be the parent who stays home the most with the children, the parent who supports the family financially, or a combination of both. Either way, we need to take care of ourselves. I’m sure fellow parents can relate to a time when you felt so sick you could barely move, but staying in bed to rest wasn’t an option. Little ones were waiting with hungry tummies and needed to be driven to school. So you drag yourself out of bed, dizzy spells and all to do what needs to be done. It’s especially hard now that many of us live afar from family. Or we feel ashamed to ask for help. We tend to rely on no one but ourselves, and our health can suffer for it. But taking care of ourselves is so important. And while it might seem selfish, it’s what has to happen if we are to be the strength that our family needs. I know myself when I reach burnout. It usually first shows as a flair of my autoimmune disease, followed by a little meltdown, and then soon after a sickness of some kind. And while it’s hard to do, and I’m stubborn at that, I know it’s time to slow things down. So how to do you take care of yourself as a parent, when you are so relied upon? It’s important to notice when you are feeling fatigued. And equally important to do something about it - like taking yourself to bed an hour earlier than usual. Putting off the early morning workout for a day or so. And not scheduling so much activity into your week if possible. We often push through, but noticing the early signs of being more tired than normal are important. Give your mental self and body a little attention. Find time to sit in nature and be still. Or push a stroller slowly if sitting on your own isn’t possible. Look at your surrounding. Notice the feeling of moving slowly. Take a bath, give yourself a facial, or simply enjoy slathering yourself in a beautiful body cream. Notice how it feels on your skin, the beautiful scent and enjoy the little moment while you can. Being mindful of an experience can help calm and slow us down. Or like I just did (after 5 months! ), go get your hair cut and tidied. When we are busy we tend to let taking care of our appearance slide. But caring about our appearance will help us feel confident within ourselves. And the feeling that we are coping and not letting ourselves go. This one is tricky, as when we are tired we are more tempted to indulge on innutritious foods and overeat. But it’s so important that we nourish ourselves when tired. Even if it’s one meal a day - make it nutritious. Start the day with a low sugar granola or muesli loaded with nuts, or make yourself a green salad for lunch. Choose one meal and make it healthy. And forgive yourself if you’re not eating so well rather than berate yourself. Often a gentle awareness of it will help us turn things around again. Is there something that you can let go of for a while? 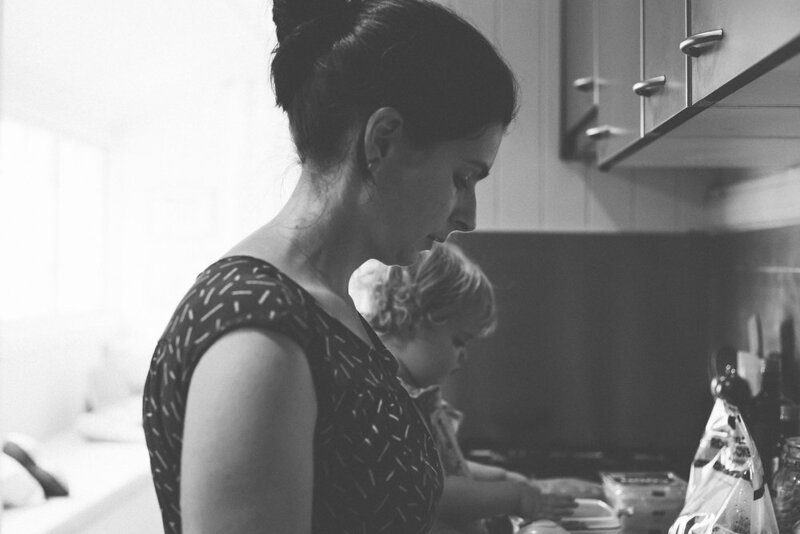 An errand or household chore, a work task that can wait, or an activity for your child? Your child will benefit just as much by having quiet time to play at home. Quite often when we feel overwhelmed simplifying a daily process or eliminating something not entirely necessary can do wonders. Accept that you are just not able to give everything in your life 100% of your time and attention. I found this one difficult. But as time goes on I’m accepting that I just can’t give each of my children 100% of my attention all the time. They soon learn that it’s just what happens - that Mum or Dad is doing something that needs to be done at the moment - and they begin to entertain themselves. Which really, isn’t such a bad thing. As a parent we are to provide love, support, and give quality attention when able, but we are also to help our children become independent. And for that they need some independent play. I talk about this one as something I’m still practising. I’m a ‘do it myself’ type of person. And very rarely ask for help. But most of us have a family member or friend who would be more than happy to be asked for help. We simply need to ask. And it doesn’t mean that we are failing. Think slow. Slow movement, slow breathing, slow down our thoughts. It’s also important to have empathy for your partner. When we are a parent and we are tired it’s tempting to lash out at our partner. We often compare the amount that we are doing to the other, and it can result in bickering. But it’s so important to learn how to be empathetic towards one another. It’s tough for both the one staying home with the children and the one out working to keep everyone fed. It’s tough when exhausted ourselves. Parenting in general can be tough. But pausing to think about the other before we lash out can help calm a potential outburst. Our wellbeing as a parent is so important. And we need to remember that we need care too. Our happiness impacts those around us and our little ones learn from us and watch how we handle difficulties. Children want us to be happy, not sad, as do our partners. We deserve to be happy in life and thrive ourselves. One of the the things I try to do as a parent is teach my children to appreciate beauty and aesthetics. This comes rather naturally to children in the earlier years - noticing and being captivated by a star sparkling in the sky or a bird flying in the distance. But as we age and become more and more distracted we can lose this skill. It’s important that we keep encouraging children to notice the beauty in their everyday. It can help us throughout life, and dealing with difficult times. I know that if I’m having a terrible day then quite often pausing to notice the natural environment around me will help pull me out of it and lift my mood. Or if indoors at home, being in an orderly and stylish space inspires me, helps keep my mind clear and improves productivity. Appreciating aesthetics also teaches children to respect their belongings and the home that we share. They treat their toys gently, and as we guide them they begin to place things where they belong without constant prompting. It also encourages independence. These tips not only help children, but help us as adults too. Talk to your children about how the clouds look or how light filters through them. Talk about the smell of the rain and how green and lush the garden looks. When at the markets point out how rich the tomatoes are or how beautiful the flowers for sale are. When at home talk about how calm and organised their room is (when it’s organised!) and how relaxing it feels. When your child creates a block tower mention how you love the design of it and the thought that went into creating it. If they bring a drawing home from school talk about how beautiful the colours look together or how you like the story behind it. If they help with dinner mention that you love how delicate they are at garnishing it and that you can’t wait to enjoy it. First and foremost we as parents need to demonstrate a respect for our home. It takes children a little while to grasp this. 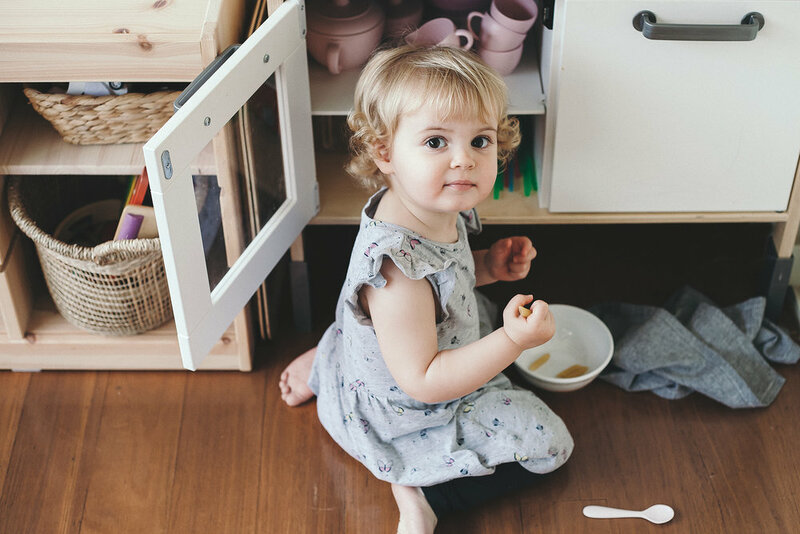 But if we keep our home orderly (without being a museum) and demonstrate a care and respect for our things, then children pick up on that and (hopefully) carry that through to their adult years. They start to appreciate organisation and where things go. And treat their items with respect rather than thrashing them about like they aren’t worth anything. So make their bed and mention how comfortable it will be to climb into at night. 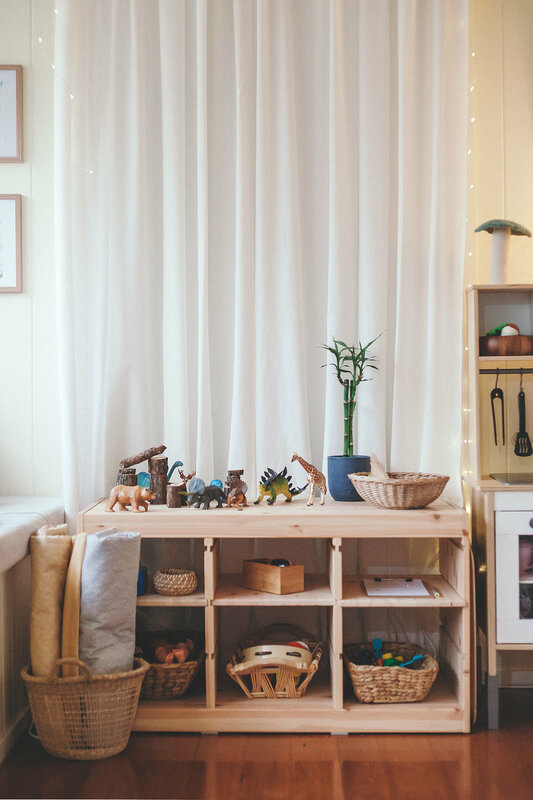 Keep their play area tidy and talk about how beautiful and organised the space looks and how easy it is to find things. I think it’s important for all of us to notice and appreciate kindness. Kindness is beautiful and it’s nice to see it in the world around us. If a friend of theirs does something caring then talk about how kind it was and how good it made your child feel. If your child consoles their sibling when upset then mention how happy and loved that would have made their sibling feel. If out in public and somebody helps another, then talk about it with your child. It teaches them about empathy. To notice and care about how others feel. Noticing how an everyday experience feels can attribute greatly to our happiness. I think this is so important to teach to our children. It’s a way of practising mindfulness without it being too forced. When we set the table make it special - throw a simple tablecloth across the table, light a candle and play some ambient music that the family loves. Talk about how beautiful and welcoming the table looks. If you have guests over for an evening celebration, talk afterwards to your children about how special and fun it was. How magical the lights looked as all the kids were playing. If it’s a cold night climb under the covers to read a book with your child and mention how cosy and comfy it feels. Children are fairly intuitive and notice when we are being authentic. When you comment about beauty be sure it’s sincere and comes from the heart. And for that, we first need to appreciate and be mindful of beauty ourselves. I hope that provides some help! It’s a wonderful thing to appreciate beauty, as I discussed in my last post. I’d love to hear how you share beauty with your child, or how you appreciate it in your own life. Since having a second child, I've adjusted my thoughts on how children play. In the past I always felt guilty for not keeping my first child constantly entertained. I don't think it's uncommon. Many parents feel the need to have their children enrolled in numerous activities so they get a step ahead in those earlier years. Or surround them with a mass amount of toys so they aren't bored for too long. While I do feel that it's important to expose children to various activities in life to see what sparks an interest, and to help them with their social skills, I also feel it's extremely important that they are given space at times so that they can develop their imagination. Rather than having parents instruct them on how to do everything. My thoughts are that constant pushing leads children to feel like they are never doing enough. Because as a child they were always pushed to do more activities, achieve more and learn faster. It's something that is bothering me at the moment with having my son in Prep (in Australia we have a year of school called Prep prior to year 1). He just turned 5 years old and is coming home completely exhausted because they are sitting for a large amount of time and learning. Of course learning is a beautiful thing indeed and at that age they are like sponges - they pick up everything easily. But I question whether it's too much too soon. And feel that exploring and free play at that young age is so important. 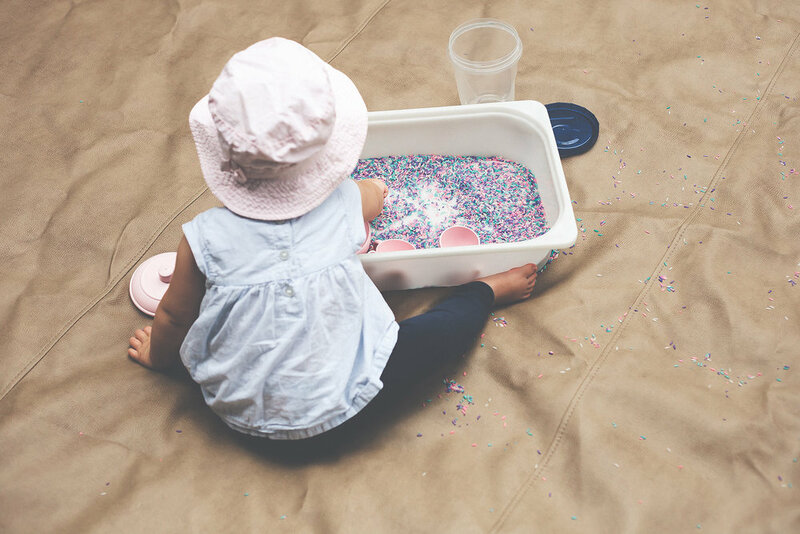 In the book The Danish Way of Parenting written by Jessica Joelle Alexander and Iben Dissing Sandahl, they say that it's important to create a sensory-rich environment coupled with play and to allow children to explore freely. It helps develop an internal compass and they are more likely to master something that brings them joy and do work in their adulthood which aligns with their true desires. I remember when I was younger saying that I was bored, often. But boredom as I'm learning, isn't always a bad thing. It encourages a child to use their imagination and make their own choices. If as parents we run to their aid with an activity, then it doesn't allow them time to decide on their own. We're providing a quick fix. A distraction. Many of us, even adults could learn a thing or two about listening to our internal drive. And find activities for ourselves that give us that sense of flow. As we become adults we tend to forget about those activities. But it's so important to our happiness and wellbeing. And those times when we are left alone. There is also a psychological term called locus of control. There is internal and external locus of control. A person with a strong internal locus of control has the power to make choices and control the outcomes of their life - their own success or failure. If they have a healthy internal locus of control, then they feel they have a sense of control over their own life. They attribute success to their own efforts. They are better at taking responsibility for their actions, and they grow from failure. If they have a strong external locus of control, they often feel they are controlled by outside influences, attribute their success to luck or fate, and are less likely to make the effort to learn. This can lead to feelings of helplessness. Anxiety. And relying on external approval or praise rather than trusting themselves. They are more likely to believe that they are not in control of their lives. So respecting a child's desire for independence and helping them develop it is incredibly important in those earlier years. Many of us have become what we call 'helicopter parents'. Which I'll admit to being at times. You're quick to jump in when something seems unsafe. To stop your child from stealing a toy from another. To rescue them when being pushed by another. But children learn through challenging themselves. By testing the amount of stress they can handle. If we intervene too quickly then they are not learning how to cope with fearful situations. They become more resilient when faced with adversity. Of course there is a limit of what to subject them to. It's that fine line of how much stress or danger is enough, without it causing severe damage or harm. It's our role as a parent to ensure our children are in a safe environment, but also allow them to take a tumble from time-to-time. If we are providing constant entertainment to children through organised activities, toys and electronic devices, hovering to make sure they don't get into danger, then what is this showing them? That they are possibly not in control of themselves and the decisions they make in life. That someone will always rescue them when they face difficult situations. That they won't learn to listen to their inner voice. And to possibly fear boredom and those times when they are alone. Something we do now with our children on a weekend is have quiet activity time. Where we all choose an activity to do on our own for an hour. At first it was difficult for our son to decide so a number of ideas were suggested. But now he is becoming more confident and independent in his choice. Choosing something that he enjoys. My daughter, well, she is a little under two and doesn't quite grasp the concept yet. But it's good practice. And as my husband and I are both introverts and need quiet time ourselves, it gives us a little mid morning breather. Which helps us be more patient throughout the day. As a parent the challenge is to find that balance between giving children enough attention, and not giving them too much. I think when we do sit and play that it's important to give them our complete attention, rather than sit distracted on our phones or pretend to listen. But if we can also help our children to explore their imagination through free independent play, then it can be a great thing for their development and creative minds.